Welcome to the newly designed Philip Chasen Antiques, Inc. website. There are many changes and improvements and probably a few bugs. What do you think? I’d love to hear from you with your comments and suggestions. Please send an email to philchasen@gmail.com. Philip Chasen Antiques, Inc. specializes in Art Nouveau and Art Deco glass and lamps and features authentic lamps by Louis Comfort Tiffany, Handel and Pairpoint; American art glass by Tiffany Studios, Quezal, Steuben, and Durand; French cameo glass by Daum Nancy, Emile Gallé, Burgun & Schverer, Argy-Rousseau, Almeric Walter, R. Lalique, Le Verre Francais and Schneider; European glass by Thomas Webb and Loetz; American art pottery by Rookwood, Grueby, Van Briggle, George Ohr and Marblehead; European ceramics by the Martin Brothers, Amphora, Zsolnay and Clement Massier; original Louis Icart etchings and paintings; and American paintings by F.S. Church, André Gisson, Pal Fried and American illustrators. 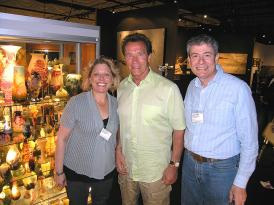 For over 40 years I've traveled the world buying and selling many exceptional objects of art. My expertise and integrity are well recognized in the antiques world. I have been dealing with many of the same clients for over 25 years. I hope to do the same with you. I hope you’ll take the time to read my antiques blog. My son, Billy, urged me to start writing about antiques, so on June 22, 2009, I posted my first entry. I update the blog once or twice a week, on Mondays and many Thursdays, with topics ranging from antique shows to auctions and lessons about glass and lamps. Please check it out by clicking on the BLOG link at the top of the page.